A great kitchen ranks high on any home buyer’s wish list. But it takes a creative builder to offer a dream kitchen that owners can take with them if they move. Brazil-based sysHaus, an engineering and construction startup that will manufacture handsome prefabricated and sustainable houses in 2019, has begun doing just that, with help from architect Arthur Casas. For now, interested parties can tour a fully built model of the 2,100-square-foot, one-story steel house to preview its possible configurations, finishes, and sustainable attributes, which range from photovoltaic panels to a “bio-digestor” that converts organic waste into gas for the kitchen and fireplace. But perhaps most surprising are the kitchen modules that homeowners can relocate with ease. 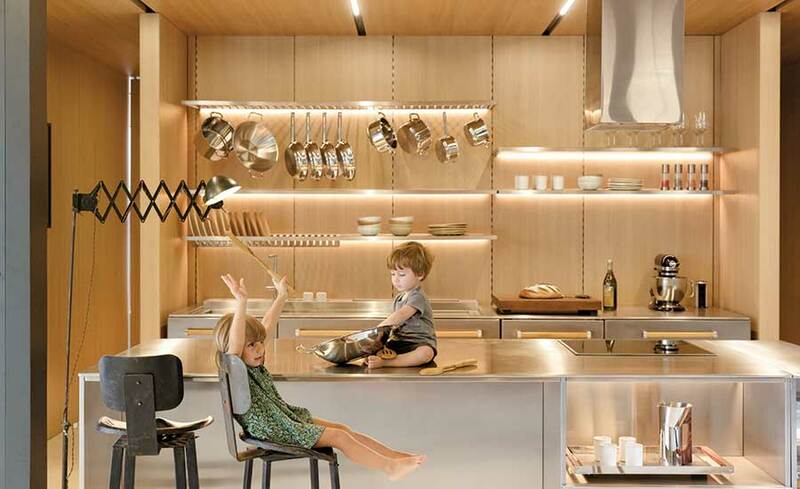 “The kitchen can be moved to another place or house just like a table or chair,” says Casas, whose project team conceived the modules as freestanding units to make this possible, and to ensure that the entire house is move-in ready within six months. The architect specified the modules in stainless steel for both practical and aesthetic reasons: durable and hygienic, steel imparts an industrial character that will have lasting appeal for most homeowners, Casas says. The look is softened by wood pulls and handles—in the show house, these are a Brazilian species called freijó, but other species will be available. Casas developed the kitchen with Mekal Brasil, a manufacturer of steel kitchen and bath components, in different dimensions to complement international appliance brands. In the model, Brazilian appliances were tucked into the island or under the counter. Meanwhile, backsplash panels are made of veneered MDF with an antibacterial and easy-to-clean finish, and have channels for wall-mounting cantilevered dish racks, pot hooks, and shelving. The shelves come with LED strip lights underneath. Residents choose modules, sizes, initial configuration, and appliances ahead of time to allow plumbing and electrical installation in advance. While the project’s sustainable features have earned accolades, it is the kitchen’s innovative design that may promise buyers the most flexibility. After the initial installation, owners can rearrange the island and storage at will. While sysHaus tapped Casas for its debut line of prefab houses, the company plans to collaborate with other architects on future designs and expand to other countries (when it launches, the house will only be offered in Brazil). “I’m particularly curious to see how my colleagues design a project with this process. It’s a challenge,” says Casas.